If you have walked passed the cathedral in Birmingham recently you may well have noticed the new restaurant, The Ivy, being fitted out. This restaurant is a sister restaurant of the rather famous celebrity hang out The Ivy in London. I decided to try it out and find out what all the fuss was about. I managed to book a table online, but had to give two weeks’ notice, apparently I’m not the only one curious about this new restaurant. We arrived ten minutes early, but were warmly welcomed and shown to our table straight away. 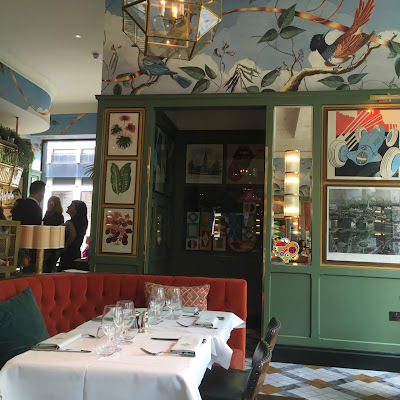 The décor of the place was completely stunning, the beautiful wall paper of birds, trees and nature scenes combined with modern art prints, made the place look rather impressive. A bottle of table water appeared, and we were asked if we wanted any drinks. I chose one of the soft drink options, Strawberry Cream Soda, and I was pleasantly surprised when a very grown up drink appeared, it was in two tones of red and clear, and even dressed with an environmentally friendly paper straw. The flavour wasn’t too sweet at all, the fruit was pleasingly sharp and the drink very refreshing. The menu although quite pricey did actually cover a wider range of budgets than I had expected, from Eggs Benedict and chips at £11.50 through to a whole lobster for £34! The waiter told us about the daily specials and I decided to opt for the Veal Escalope. Being of German heritage to me this is a schnitzel, and the restaurant would now be competing with my mum and grandmothers traditional cooking. I asked what came with the Veal Escalope and the waiter said that there was just some watercress, and a garlic sauce. I added broccoli and mashed potato to make it more of a meal. To be honest this is one of my pet hates of restaurants, where the main course needs accompaniments which push the whole price up. Oh well, it is posh I suppose. The meal arrived and it did look like a fair portion, the sauce turned out to be a small jug of garlic oil, which was a little weird to me. 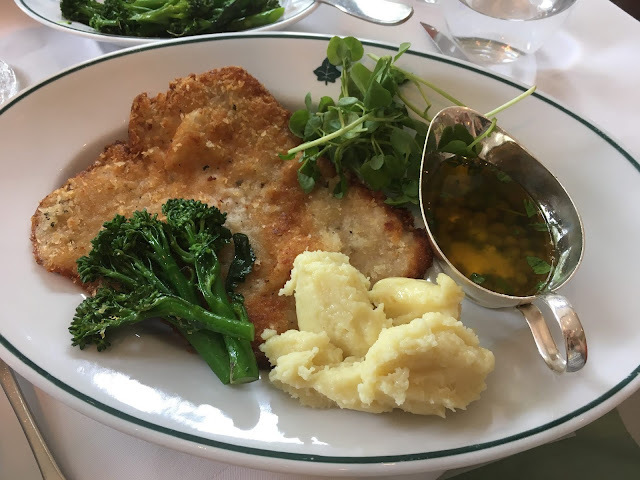 I have eaten many a schnitzel, sorry Veal Escalope, in my life and I can’t remember one that has had a sauce with it. I poured a little on to get the full experience. The meat was thin and very tender and soft, and the crispy breadcrumb coating added a lovely layer to the texture. The meat was well seasoned, and really didn’t need the sauce. The mashed potato was a complete wonder, light fluffy and beautifully buttery. It was clearly whipped within an inch of its life and completely melted in the mouth. The broccoli was cooked well, but admittedly not the most exciting accompaniment. Despite being quite full after a wonderful plate of food, I really couldn’t resist opting to see the dessert menu. 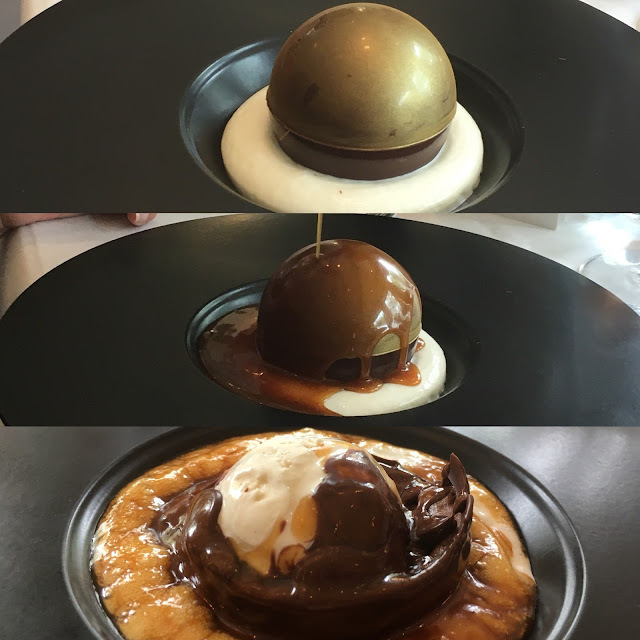 As you may have noticed from this blog I do like my chocolate so chose the Chocolate Bombe. I wasn’t sure complete what to expect, but it turned out to be quite a theatrical dessert. A bowl arrived with a bed of ice cream and a chocolate globe on top, the waiter then poured hot caramel sauce on top and the chocolate melted, the whole thing was really quite stunning. The flavour from the hot caramel sauce was absolutely divine, sweet and with a hint of salt. When this mixed with the ice cream and the chocolate it created a perfect mix of flavours, rich chocolate, mellow vanilla, strong caramel and every mouthful was different depending on the main ingredient on the spoon. This made it a delight to eat, and the mix in temperature was a fun treat too. Seriously had the place not been so posh, I would have licked the bowl! 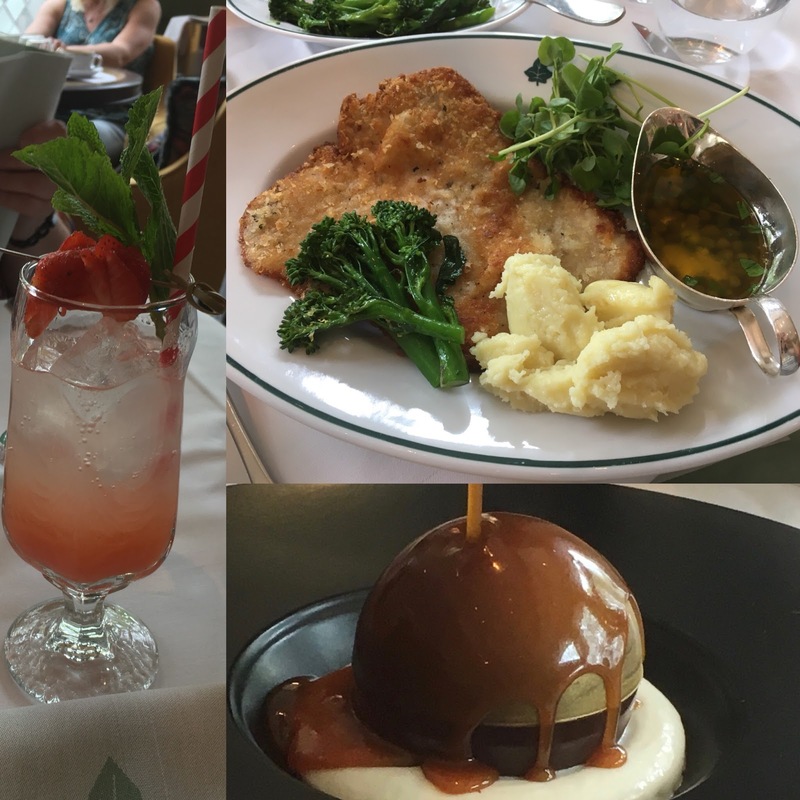 So all in all the food at The Ivy in Birmingham certainly lived up to the reputation, it was a proper experience being there. The waiter couldn’t have been more attentive, checking on us and despite being busy, we didn’t wait long for any course. The dessert was out of this world, and made the whole meal for me. It is a pricey place, but I think it will end up being my first choice for a luxury treat.